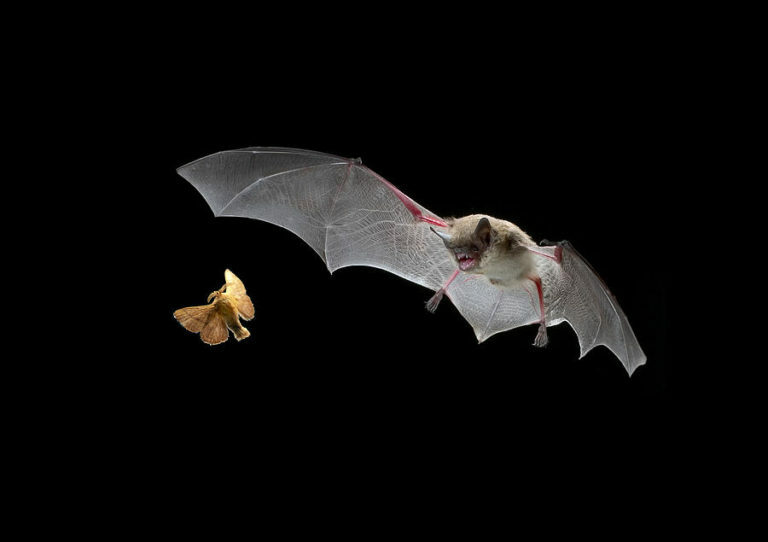 A little brown bat hunting a moth. Where the four main subspecies live. The little brown bat (Myotis lucifugus) is by far the most common kind of bat found in the north-eastern US. They are found in North America from Georgia to Alaska and from northern California to Newfoundland. But since 2007 they have been dying by the millions from white-nose syndrome. Little brown bats are now an endangered species. Myotis means mouse-eared, lucifugus means fleeing the light. Like vampires, they sleep during the day and come out at night. Humans mainly see them on summer evenings flying near caves or over a body of water. Size: About 8 to 9 cm or 3.5 inches – small enough to hold in your hand. Their wings spread to 23 cm (9 inches). bats. You see them flying in a swarm. Food: They feed on mainly on insects, especially flies and moths. They like to fly through a swarm of midges with their mouth open. Echolocation: Their eyes work, but like all bats they mainly use echolocation to fly through the dark. By making high-pitched clicking sounds they can tell what is in front of them (a tree, another bat, even a fly) from how the sound waves bounce back (the echo). The clicks are too high-pitched for humans to hear. Hibernation: Some bats fly south for the winter, but little brown bats do not. In late October and early November they find a cave or mine shaft and sleep upside down, close together, through the winter, maybe waking up once every two weeks. Their bodies get close to freezing and live off their 2 grams of body fat. They come out of hibernation in March or April. Mating: They generally mate in the autumn. The female keeps the sperm inside her body, not becoming pregnant till the spring. Each female generally has one pup a year, born in late May or early June. In the spring and summer they roost in buildings. Guano: In the early 1900s their bat droppings were used as fertilizer by humans. White-nose syndrome: In 2007 in upstate New York bats started dying in huge numbers. The dead bats had white noses. It turned out to be a cold-weather fungus, Pseudogymnoascus destructans (fka Geomyces destructans). By 2013 it had spread to 22 US states and 5 Canadian provinces. It has since spread to six more states. It wipes out 90% of the little brown bats in the caves to which it spreads. The same fungus is found on bats in Europe to little ill effect. Most of the little brown bats who have it die in their sleep during hibernation. Before they die they are seen flying during the day (!!!) in the middle of winter, dangerously running down the fat reserves needed to make it through the winter. Columbian Exchange: The fungus was first seen in North America in 2006 in upstate New York at Howe Caverns, which get 200,000 visitors a year. Presumably a European tourist brought the fungus there by accident. Sources: mainly “The Sixth Extinction” (2014) by Elizabeth Kolbert; “National Audubon Society Field Guide to North American Mammals” (1996) by John O. Whitaker, Jr. I never found anything cute about these critters. Interesting you should write about them. It was not based on cuteness points, but because they are an example of an animal going extinct in my time and place, an animal I have seen. Bats may not be cute but they are fascinating, a mammal with wings! Unlike the flying squirrel, bats are capable of true flight for prolonged distances. From an evolutionary standpoint, they are remarkable. I was wondering, where is Texas on the map, esp. those bats that ravage Austin. Then I looked up that that is Mexican free-tailed bat (Tadarida brasiliensis), the state bat of Texas and Oklahoma. Texas has the most bat species in the US although the Little Brown bat is not common. 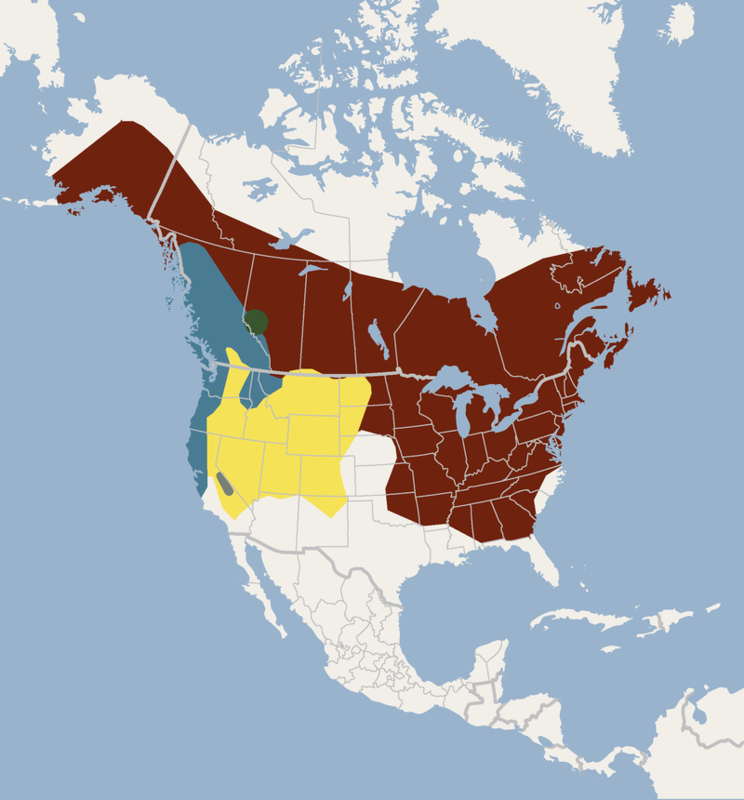 I wonder how many states have adopted the Little Brown bat as their State bat.